How marvelous is the cellphone! Who today is without one in his or her car? Not very many. Of course, emergency vehicles have had radio telephone communication for years, but not the general public. The increasingly common sight of people driving down a highway talking on a cellphone still seems amazing, if not hazardous. Nevertheless, we should restrain the urge to "back-pat." After all, it's taken about 80 years for our much touted modern technology to catch up with the thinking of A.H. Grebe, "Expert Radio Constructor," a characterization of Grebe by the editors of an article in the August 1919 issue of Radio Amateur News. Entitled "The Auto Radiophone," this article was written by Grebe himself, then only 24 years old and running his own company to manufacture amateur radio equipment. In the article, Grebe talks about how communication by radio telephone was already indispensable on aircraft. He believed it could also be used in "many places on land over spaces which cannot be economically spanned by wires." Thus, began his experiments with a radio transmitter self-contained in a motor car. Figure 1. 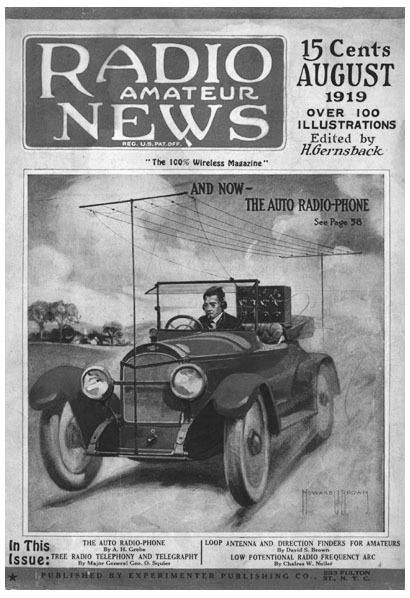 The cover of the August 1919 "Radio Amateur News" featuring A.H. Grebe, Sr., in his Buick outfitted with an auto radiophone. Inspired by the cover of the 1919 Radio Amateur News, shown in Figure 1, Ron Frisbie began to think about simulating some of the photos in the issue. Obviously a man of vivid imagination, Ron was in the unique position of having all the right ingredients to carry this idea through. First, he has a large Grebe collection, including a Model CR-14 that would serve for what is apparently a Model CR-6 receiver in the magazine photos. Second, he has an antique car -- a beautifully restored 1928 Ford Model A Roadster. This car resembles what is more than likely a 1919 Buick owned by Grebe and shown in the article. Third and best of all, his friendship with Grebe's son allowed him to think about the possibility of having Alfred Grebe, Jr., pose in the car with the equipment as his father had done for the magazine article. Ron contacted Editor John Terrey to ask if he had any interest in the subject for an article. Naturally, the answer was, "Go to it!" A little history of the Grebe/Frisbie friendship might be in order. Ron first met Alfred, Jr., about eight years ago at a Radio Club of America meeting in New York City. Though his father had died when he was only five years old, Grebe, Jr., maintains an interest in his father's field. He expressed surprise at learning of the existence of Ron's rare Grebe CR-10, and often mentioned his hope of traveling from Richmond, Virginia, to see it. Over the next several years, the two talked of a time when Grebe, Jr., might come and also have his photo taken with the CR-10. Finally, it happened, as shown in Figure 2. But, Ron had even bigger ideas. He had set the wheels of a real "photo op" in motion by first finding a photographer. 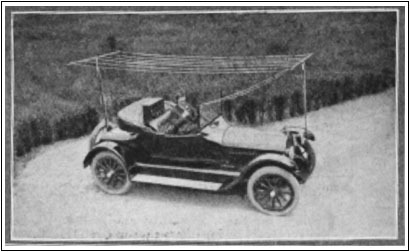 Next he installed poles on his Model A and strung wires between the poles as an antenna, just as Grebe, Sr., had done for the 1919 article. Figure 3 shows Grebe, Sr., fully equipped in his Buick, a scene Ron re-created for our cover. Placing the Grebe CR14 on the folded down top behind the driver, Ron prepared to place a microphone in the hands of Alfred H. Grebe, Jr., in order to simulate the 1928 magazine photo of Grebe, Sr. Figures 4 (see print version) and 5 show Grebe, Sr., in the magazine photo, and Grebe, Jr., in the re-created photo. As the photo of the two friends in Figure 6 (see print version) conveys, the visit was a huge success from beginning to end. Grebe, Jr., greatly enjoyed tuning Ron's CR-14, as shown in Figure 7 (see print version). In addition, he had brought along a family scrapbook containing copious notes and a letter from his father, the only one in his possession. The two friends pored over these papers, enjoying them as only amateur radio historians could, and Ron learned a great deal more about Grebe, Sr.'s, life. Figure 2. Alfred Grebe, Jr., admiring Ron Frisbie's rare model CR-10. 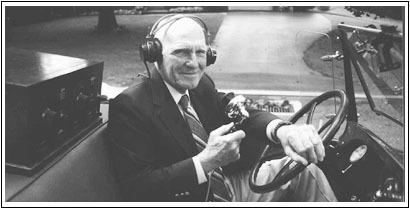 Born in 1895 in Long Island, New York, Alfred Grebe, Sr., began making radios at age 12. His early passion for radio is even the subject of a cartoon in a 1931 edition of the New York Sun, shown in Figure 8 (see print version). By age 26, he was the owner of a company with 65 employees who were turning out 300 sets a week. As most radio historians know, those sets were so well built that they are prized items in collections today. In 1935 at age 40, A.H. Grebe, Sr., died an untimely death, the victim of complications following botched surgery. In his brief lifetime, he had enjoyed no small degree of fame, as shown in the tribute to his memory by WABC, the key station of the Columbia Broadcasting Company. See Figure 9 (see print version). The impact of his work was so widespread that it warranted a letter from Grace Coolidge, wife of the President, dated the White House, 1928, and reproduced in Figure 10 (see print version). However, though he had experienced great success, Grebe, Sr., also knew failure. He had seen his factory double in size by 1925, and then go bankrupt in 1932. In 1935, his intention had been to set up a West Coast factory, while in the meantime, Garod produced his sets. However, that dream dissolved with his death. Grebe's widow, Stephanie Grebe Harvey, who celebrated her 100th birthday in May 2000, lives on in Michigan. Ron received a letter from her thanking him for birthday greetings and for remembering her "wonderful husband, Alfred Grebe." She also says, "Inventing and manufacturing radios gave the people of this country more than they know. What would we have done without radio?" Indeed. According to his Radio Amateur News article, Grebe used a 6-wire flat top antenna as the radiating member in conjunction with the frame and body of the car as a counterpoise. When not in use, the antenna system was slung under the running board on hooks -- portability was "in" even then. The transmitter consisted of a panel and cabinet assembly, including the vacuum tube mounting, choke coils, oscillating circuits and modulating system. The operating wavelength was 150 meters. A storage battery back of the seat provided power for the filaments of the vacuum tubes in the receiver and transmitter, and also powered a small dynamotor. The receiver consisted of a variometer type of regenerative receiver with two stages of audio frequency amplification. Signals from ship stations and land stations within a 150-mile radius were copied without difficulty. Grebe makes an interesting observation that we can still relate to sometimes on the highway. When other cars operated nearby, there was interference from discharges at the spark plugs, which was plainly heard until the passing vehicle was quite far away. In concluding his article, Grebe says it is safe to say that his tests showed that "the auto-radio-phone is entirely practical, and the near future should bring extensive developments along these lines, and we may soon hear an SOS: 'Send an emergency service car to car No. 999-999 three miles east of Suburbanville.' "
He was off on only two counts -- SOS has become simply 911 and "soon" came much later than he had predicted. Citizens band transceivers became popular in the 1970s, but not until the 1990s did "auto radiophones" for everyone become commonplace. A.H. Grebe was, indeed, a man ahead of his time. Figure 3. A complete view of Alfred Grebe, Sr.'s, auto, showing the antenna construction. Ron Frisbie reproduced this scene for our cover. From "Radio Amateur News," August 1919. Douglas, Alan. Radio Manufacturers of the 1920's, Vol. 2. Chandler, AZ: Sonoran Press, 1989. Gernsback, H., Ed. Radio Amateur News, August 1919. Photo credits: Preston Whitcraft and the Grebe family archives. Ron Frisbie was inducted into the Pennsylvania Telephone Hall of Fame in 1998, after a 50-year career in the telephone industry. 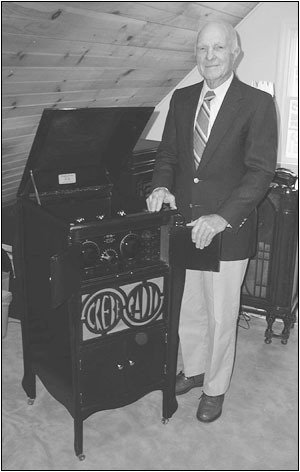 His interest in radio began in 1931 at age nine when he constructed his first 1-tube receiver. A serious collector for over 20 years, he specializes in early wireless and battery sets. In 1993, he fulfilled his longtime ambition to open a museum where one-quarter of his 2,000 receivers are displayed. Figure 5. Alfred Grebe, Jr., also radiophoning en route, as his father is doing in Figure 4 (see print version). Copyright © 1996-2000 by John V. Terrey - For personal use only. Last revised: December 24, 2000.